Ok... I've always had a fascination with all of the cool things people do with men's ties... but I'm thinking I love this the best! 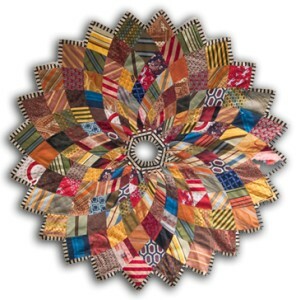 This Christmas tree skirt is made from ties !!! It's so colorful and very, very wonderful. It can fit both the artistic quilter and the primitive! HOWEVER... this puppy is FOR SALE for a mere.... $1200.00 !! Whip out your checkbooks and buy me ONE..!!! Can you imagine. BUT once you look at it close up and all the work that is involved you can see why. Have you ever sewn with ties? I haven't... but I envision them to be slippery, raveling all over the place... and really, really hard to keep your seam straight. Now that I've scared the stew out of you (never wanting to work with ties), I'm challenging you to help me find a pattern for this sweet thing! Does anyone know where it could be???? 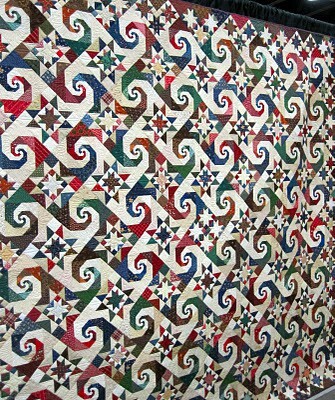 Now this idea needs to be used on my kitchen rugs. I've tried the woven rubbery stuff under them... nope...doesn't work well... they still slip. I'm going to get my honey on this project. He'll be more than happy to help...he hates the slippery rug thing... makes him VERY unhappy! "Slip-proof your rug: To give an area rug some traction, flip it over, and apply lines of acrylic-latex caulk every 6 inches or so. 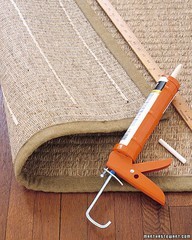 Once dry, you can safely put down your rug; the rubbery strips will hold it in place.. . . brilliant!" Wow.... is this some kind of work or what? My head spins when I look at it. I just think it's fantastic. When you look close... the centers are different in some of the blocks... Here is the link to look at it closer and to find out more information on getting the pattern instructions. Hey... I could watch for this in my mail too...!! So exciting... HA!! I know this is a Christmas Idea... but I just couldn't help myself in sharing it with you. I think it's so cool and I only wish I would have thought of it years ago when we were first married! 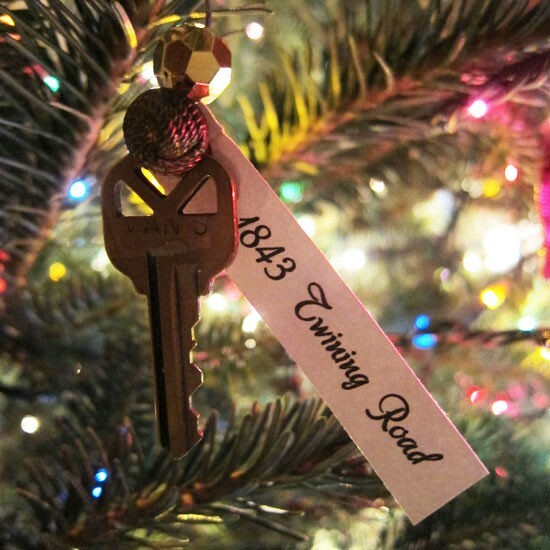 Every time you live in a house or apartment - keep one of the keys and make it into a cute Christmas decoration for your tree. Then when you are trimming your tree you can remember back to those days and remember the fun times, how you decorated your place, friends you hung out with, vacations you took, etc. Isn't that sweet? I thought it would be cute to give to children for those special events for later in their life... like - this is the house you were born in (maybe attach a little photo in a frame attached to the key), this is the house where you first learned to ride a bike, this is the house where you lived when you started school, this is the house you lived in when you lost your first tooth, where you went on your first date, ssssssseeeeeeeeeeee............ get the idea???? I know it will mean a 'hill of beans' to them when they are little... but when they get to be older - they will love it. That you took the time to make these memories for them. So... this is my theory.... it you want to start NOW and your children are older (let's say in grade school) find some old keys... make the memories from them and then save them! (they will have NO CLUE they are not the actual keys from the house... tee hee!) Then from this day on - you can use the actual keys. Sound good? Please let me know if you all decide to do this. I just think it's a sweet idea. Look at this sweet thing! I just think it's adorable and I'm just going to have to make one of these. What can I do with it then...hhhmmmm... I know.. 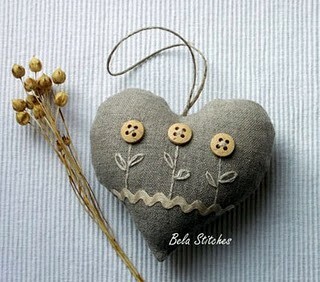 I'm going to hang it from the latch on my yellow cabinet in my sewing room... it will look adorable there! 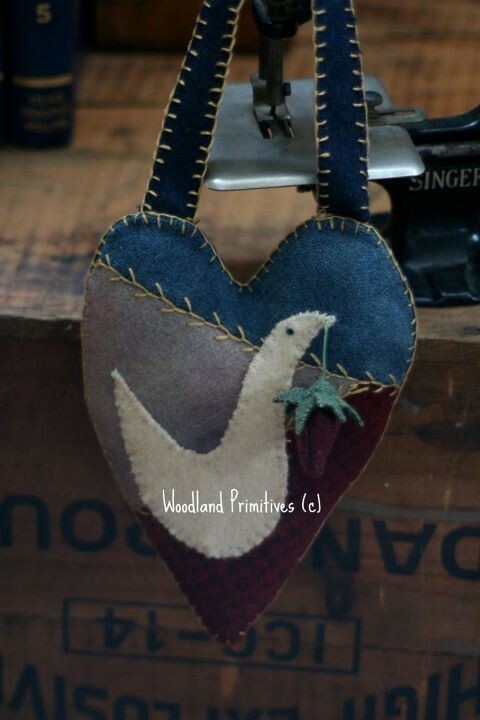 I saw one similar to this hanging from a picture of grandchildren that was hanging on the wall. 3 of them in one picture (one for each flower)... they are the 'hearts' of their Grandma and Grandpa... that's for sure!! Then... we have this SWEET bird holding a strawberry!! OMG ... I just think this is adorable. I'm going to put it in my 'wool project' folder for a future project with the B-A-A-A-D Girls Club at Cinnamon's. 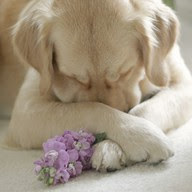 I think several of the gals would love this little fellow.... Wouldn't you???? Ok... tomorrow and the next day are ... 'hustle days' with loading the van for Camp Blanding... running errands... buying coffee stuff... making copies... so you WILL NOT GET A BLOG POST FROM ME.... I'll pick back up after my duties are done!! Hey... almost forgot... here is your organizational tip for the day! Find a storage shelf that is a MESS!! Go through everything - purge, merge and straighten. Remember to use baskets, plastic containers, etc. and get things looking spiffy! !